You just can’t be everywhere at once. Sometimes it seems nearly impossible to get everything accomplished when there is just one of you. Wouldn’t it be nice to have a clone? That is one reason why it is important to have a highly-trained sales team in place. In a 2015 Facebook survey of nearly 580 livestock producers who use supplements, 48% of them said they expected their dealers to have product knowledge and rely on them for their recommendations. Since research has shown that employees are happier and feel more like part of the team when they are knowledgeable about the product, it makes sense to provide them the necessary training to increase rapport and productivity. According to Lessonly, productivity increases by 22% when employees are properly trained. That means productivity of one employee who makes $30,000 per year, could increase $6,000. Taking the time to train your employees is a good investment, especially if you multiply that $6,000 by the number of employees you have. To educate dealers and keep them properly trained – the next best option to cloning – BioZyme introduced its Master Dealer Program in June. The program, which provides online training is one way to keep dealers knowledgeable about the various products, their uses and BioZyme services. 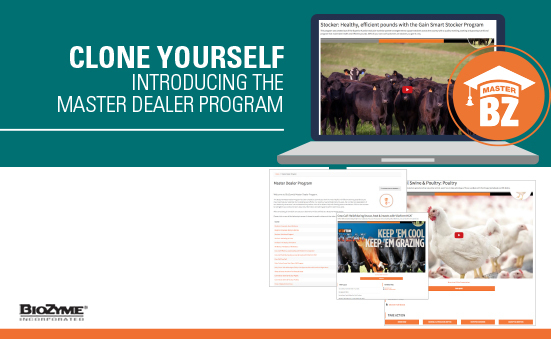 Located on the Online Dealer Center, the Master Dealer Program offers a variety of learning modules covering topics from Amaferm® and stocker cattle to commercial poultry and horses. After each brief training video, there is a quiz for the participants to take. After all quizzes are passed and all other requirements are completed, the dealer will receive Master Dealer recognition. 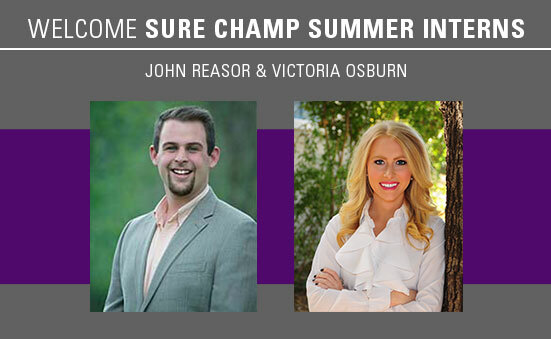 In addition to completing the training modules, other requirements to meet the Master Dealer designation include having at least two employees for each dealership complete the training (unless there is just one person involved with the dealership); stocking four of the five following brands or products: Sure Champ®, VitaFerm® Concept•Aid® or VitaFerm® HEAT®, Gain Smart® , Vita Charge® or Vitalize®; and completing two courses in continuing education training each subsequent year. Once a dealership has completed all the requirements for Master Dealer, it will be recognized and marketed as such. It will receive a special designation on the Dealer Locator page, signage with the Master Dealer designation will be provided to the store; and employees who complete the training will be given a special jacket with the BioZyme Master Dealer logo on it. While cloning yourself, as nice as that sounds, may not be possible, taking the time to train yourself and your employees is something you should definitely invest in! Your employees will feel more like a team, and your customers will feel like they are being treated by knowledgeable staff every time they contact someone about BioZyme products. 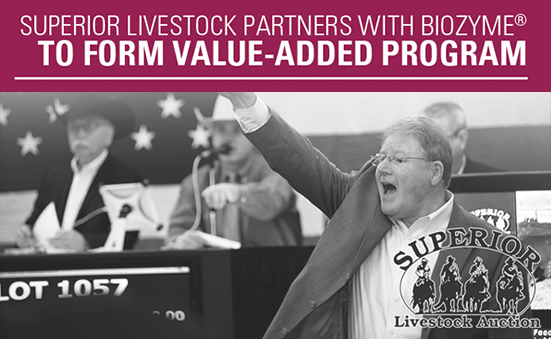 The leader in livestock marketing, Superior Livestock Auction, has teamed up with BioZyme® Inc., to add the first ever nutrition-based program to its list of value-added programs. 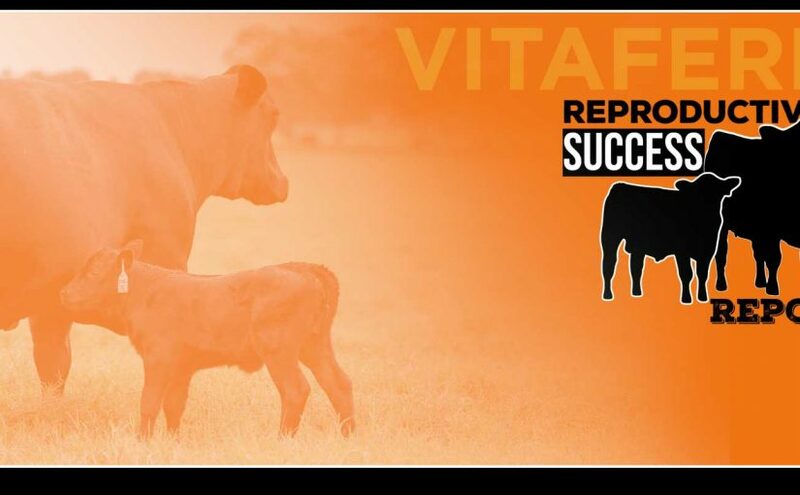 The VitaFerm® Raised and Gain Smart™ programs will add value at marketing for those consignors selling their calves through Superior. 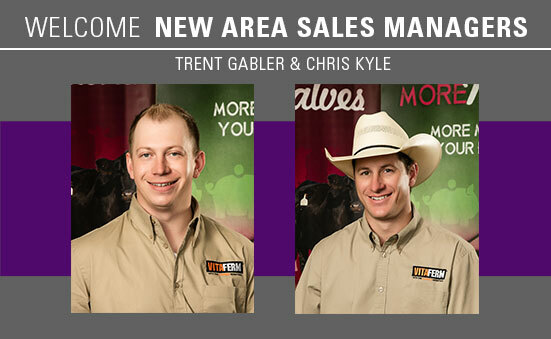 Producers work hard for their profit, and it makes sense to partner with a leading nutrition company to see faster gains while receiving premiums at sale time. More information typically means more profit for the producer. Healthy cattle gain faster, and cattle that have been fed a BioZyme product will handle stress and transportation more effectively while acclimating faster to a new environment. Barber says BioZyme was a natural fit for the value-added partnership since BioZyme is a progressive company that also likes to create value for its customers and moves quickly to put plans into motion. Another added advantage is many of the producers who market on Superior already feed a BioZyme product. Barber adds that the great staff at BioZyme, from its nutritionists, marketing staff and sales force is another benefit. The two companies have been building relationships between staffs since some summer meetings to provide education about BioZyme products to the Superior reps. And those relationships can only grow stronger as BioZyme dealers reach out to the Superior reps in the area to work together to educate the producers about the benefits of VitaFerm Raised or Gain Smart. The job of stocker cattle is to turn cellulose into red meat, by putting on weight in the most cost effective way – gaining smart. 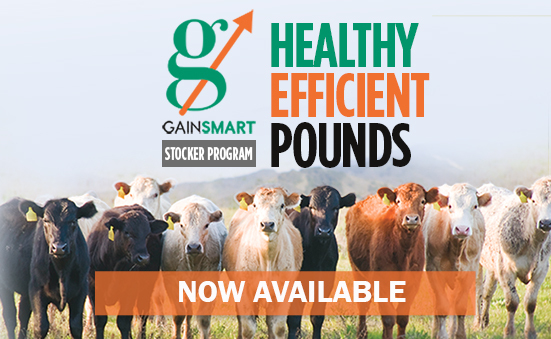 The Gain Smart Stocker Program provides a 1-2-3 punch to get calves eating and staying healthy. It includes 2 products to jump start appetite and a line of vitamin and mineral supplements with the Amaferm® advantage that promotes health and economically produces pounds by maximizing the natural energy and protein available in forage. This program will easily draw stockers to your doorstep due to its effectiveness on gain and health. 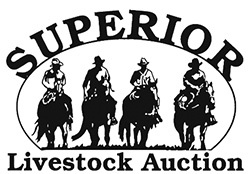 However, to add icing on the cake, we have launched an exclusive partnership with Superior Livestock Auction. 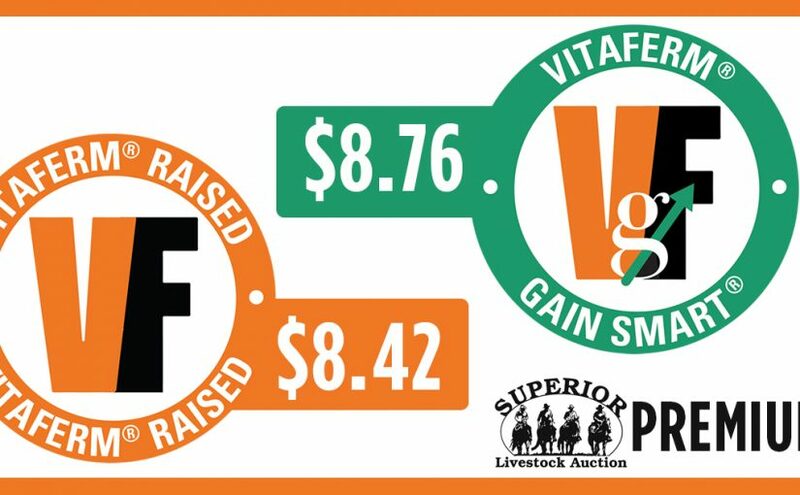 Beginning October 2016, calves selling through Superior Auction will be able to add a value-added emblem (see below) if they have been fed Gain Smart for the 45 days prior to the sale or have been on a VitaFerm mineral for the 45 days prior to sale. This program will be heavily marketed to bring new business to your door. Click Here for details on the Gain Smart Program. Call your ASM today to order Vita Charge Drench, Stress Tubs and the Gain Smart Mineral that is best for your customers. FYI :: We have developed a program for Superior Reps to be able to purchase VitaFerm and Gain Smart products at a discounted rate. Seeing is believing, and we hope to encourage any Superior Rep to try our products first-hand. If you have a relationship with a rep in your area, please make sure they are aware of this program! Contact your Area Sales Manager for assistance in filling out the required form for this program. Step 1. Select the correct VitaFerm supplement to maximize the potential of your cow herd. Contact Erin Creason, Inside Sales Coordinator, at 816-238-7084, visit www.vitaferm.com or speak with your dealer to learn more about these products. Eligible VitaFerm products and product lines include: Concept•Aid®, Heat and Cattlemen’s Blend™, the Mineral Lyk Tub, 30:13 Protein Tub™, Roughage Fortifier and Sure Start® Pellet. Step 2. Each time you purchase an eligible VitaFerm product, take a picture of your invoice with your smart phone or camera and email a copy of the invoice to hereford@biozymeinc.com or text it to the BioZyme office at 816-383-3109. Step 3. 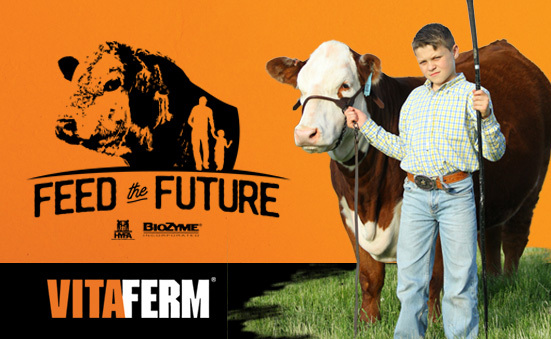 BioZyme will donate $1 per bag or tub with the proof of purchase to the Hereford Youth Foundation of America. Donations will be made annually. At BioZyme, we believe in the value of partnerships. This starts with the one we have with you, but will certainly be impacted by the ones we are starting with Superior and HYFA. We believe programs backed by powerful partnerships are the key to improving sales, margins and profits, to exponentially increase business success. The BioZyme Online Dealer Center hosts an incredible tool for gaining product knowledge and direct access to our nutritionist team. Here you can post questions about anything you’d like in regards to product information, selling tips, shipping or freight and more. You are guaranteed to receive a response from our team, but this is an opportunity to interact with dealers as well. 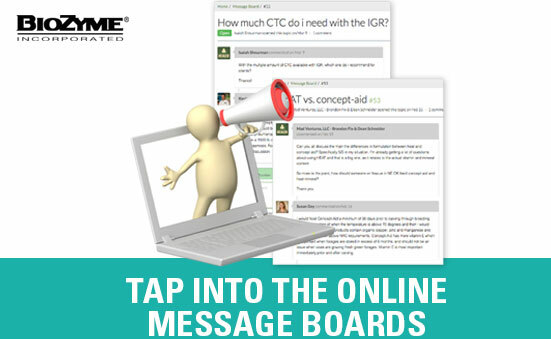 Great discussion is always happening on the message board and we invite you to join by going to the Online Dealer Center at www.biozymedealer.com and selecting Resources >> Message Board in the main navigation menu located at the top of the screen! Now is the time to begin thinking about your creep feed rations. Creep feed allows producers to efficiently put weight on young calves, as small calves are very efficient at converting feed to gain. Also, as calves pass the 90-120 day mark, they begin to need additional supplementation as the lactating beef cow is only providing 50% of the daily nutrition that the calf needs. Ideally, lush pastures would provide the additional nutrition; however, lack of pasture due to challenging weather or acreage constraints can limit this. At BioZyme® we offer three different products that can be incorporated with feedstuffs found at your local mill to create a complete creep ration, and a fourth product that can be incorporated into any pre-formulated/bagged creep feed. Our wide variety of proven products help keep your cattle healthy and efficient. Producers also notice a big different in consistency in intake, and calves transition more easily at weaning. 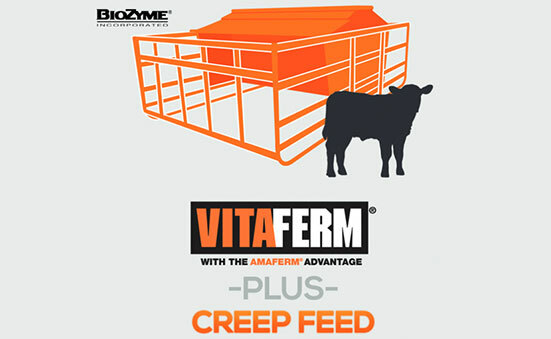 All VitaFerm® products contain the Amaferm® advantage, which increases the digestibility of feed and improves digestive health, allowing for more efficient gains. Proven in the show ring, but works equally as well in creep feed to help maintain the strong appetite and healthy digestive system needed to unlock the genetic potential of your calves. Contains high levels of essential micronutrients for the extra bloom that show and sale cattle require. A high protein and macro minerals pellet that is a great fit for building today’s modern creep feeds. Contains moderate levels of essential micronutrients to ensure animal performance. Use it alone for commercial calf creeps or together with Sure Champ to build high performance show and creep rations. The ideal supplement for stressed cattle during weaning. This pellet also works extremely well as a creep balancer, bringing high levels of vitamins and minerals when additional protein is not needed. Works well in distillers and corn gluten-based creep feeds. A low inclusion way to supplement Amaferm in any diet. At the feeding rate of 0.5 ounces, Digest More provides 2 grams of Amaferm. Digest More is best suited when additional protein, vitamins and minerals are not required. For more information about creating a custom creep feed ration, contact Lindsey Grimes, BioZyme Nutrition Field Support, at lgrimes@biozymeinc.com or 816 596-8779.